Weekly poetry and fiction series featuring area students and writers fills the upper room of the Sphinx Hookah Cafe. This week's featured readers TBA. Local poets perform slam poetry in a three round, invite-only slam to field the Pittsburgh team for the 2011 National Poetry Slam in Cambridge, MA; hosted by DJ Brewer. Pittsburgh Lectures welcomes Pittsburgh-native Matthew Gallaway, author of The Metropolis Case (Crown, 2010) to the first reading in this new series. Local poets speak out about the need to create communities that are built on inclusion, diversity and fairness; that are free of discrimination and intolerance; and embrace change that is citizen driven. Join The New Yinzer for another installment of TNYPresents. Featured writers include Kristin Ross, Jen Michalski, Adam Robinson, and Kelli Stevens Kane. Sara Marcus, author of Girls to the Front: The True Story of the Riotgrrrl Revolution; Alison Piepmeier, author of Girl Zines: Making Media, Doing Feminism; and Jenna Freedman, zine librarian at Barnard College, are guest speakers. 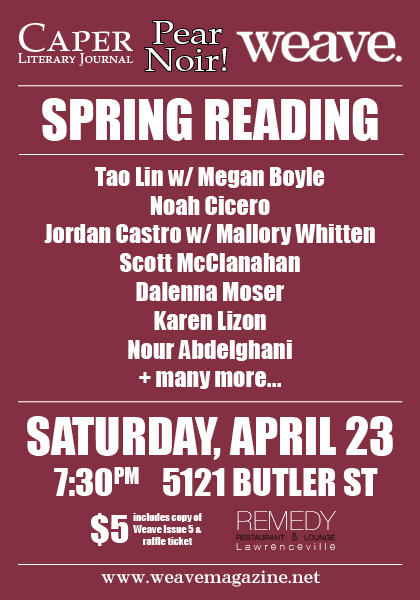 Weave Magazine, Pear Noir!, and Caper Literary Journal present the most exciting night of readings in Pittsburgh this spring! Admission includes a copy of Weave Issue 5 and a raffle ticket for your shot at winning some awesome prizes. The night will also spotlight contributors to each publication, featuring some of the most exciting young voices in independent literature including Rae Bryant, Chris Nold and Laura E. Davis (Caper); Tao Lin & Megan Boyle, Noah Cicero, Jordan Castro & Mallory Whitten, and Scott McClanahan (Pear Noir! ); Dalenna Moser, Karen Lizon, and Nour Abdelghani (Weave).